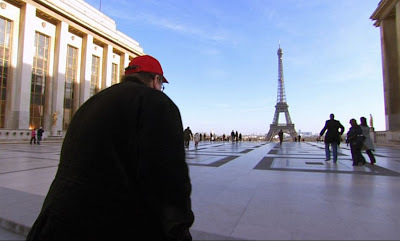 Michael Moore’s documentary film SiCKO (2007) raises such fundamental and interlocking issues about modern society and culture that it is difficult to know wh ere to start the discussion. With documentary films, of course, there are always two basic threads that one can usually consider separately: (a) the external issue under discussion and (b) the nature of the documentary expression undertaken by the filmmaker. But with Moore’s film, everything is connected and overlapping. According to the UN’s World Health Organization report in 2000, the United States ranked 37th in overall world healthcare (France ranked 1st overall). According to the CIA’s World FactBook, the US ranks 49th in life expectancy (France ranks 8th). One of the basic problems with the US system is that it, alone among leading developed nations, does not provide its citizens with universal guaranteed healthcare, leaving about fifty million people without any health insurance at all. One could spend weeks, even years, examining the specifics of this vast, complicated, and important subject, and a two-hour movie is not going to do that. In fact SiCKO doesn’t introduce much information that most people don’t already know, but it does go on to raise an even larger issue – and in this connection it rhetorically asks a disturbing question: what kind of society does America have that it can treat its own fellow citizens as objects that have a price, i.e. virtually as “pieces of meat”? 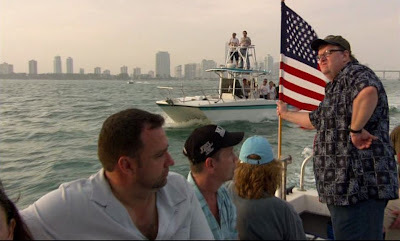 Let us put the disturbing nature of that question aside for the moment and consider the other main topic of discussion here, which is the nature of the documentary film expression employed by Michael Moore. I am always amazed by the animosity and contempt that so many people seem to feel for Moore. Right-wing and politically conservative people, of co urse, are inevitably offended by his positions, and they might be expected to dismiss his films. But there are also many political independents, even a great many people on the political left, who dismiss Moore as a liar, a “sleaze bag”, a slovenly showman, someone who is out to distort the truth and manipulate the audience. Why do they hate him so much? For one thing, they seem to despise him for appearing personally in his films and confronting some of his subjects on camera with troubling questions, which Moore’s critics often consider to be self-serving. But there is a deeper American cultural theme that underlies this animosity towards Moore, and it has its connections with the history of documentary films. The notions of cinema vérité, which actually go back to the work of Dziga Vertov and his Russian colleagues in the 1920s, became popular in France during the 1960s. The goal was to capture objective reality, “the truth”, with the camera. When the popularity of cinema vérité spread to the US, it became known as “direct cinema”, but there was an often-overlooked difference. The American filmmakers adopted a “fly-on-the-wall” approach: they wanted to make the camera so inconspicuous, so “invisible”, that the subjects being filmed were not consciously aware of its presence. The camera was to be an objective record of reality. But of course this is a fiction: the camera always has its presence and its point of view in any filmmaking activity. The French cinema vérité documentarians tended to acknowledge explicitly this presence of the observer, and they incorporated their own observations into their recordings. The fundamental distinction between French cinema vérité and American direct cinema relates to a fundamental philosophical divide separating two ways of looking at the world, which I call “Objectivism” and “Interactionism”. Interactionism (which could also be called the “the Phenomenological”) recognizes that the observer invariably and essentially has an effect on whatever m ay be observed (as attested to by physicist Werner Heisenberg with his Principle of Uncertainty). For Interactionism, every human activity invariably involves an embodied interaction with something else (even, as Heisenberg noted, when interacting with a scientific instrument). In this respect, rather than Cartesian dualism and Newtonian analysis, one should associate Interactionism with Buddhism, Sufism, and the work of Merleau-Ponty. From the Interactionist perspective, Objectivism is only an abstract ideal that has pragmatic application in many domains, but not all. But real experience, which is inescapably interactive, can only be approximated by Objectivism -- and only approximated accurately some of the time, such as when observing more remote physical objects, like the stars. In other spheres of activity, where account of human interaction cannot be minimized, such as the sphere of human social activity, Objectivist approximations are particularly weak and inaccurate. “Direct Cinema”, which has dominated the American imagination when it comes to documentary filmmaking (even though it is only one style and not even the most common practice), exemplifies Objectivism, or claims to, anyway. Note that in fact, direct cinema documentary filmmakers have shooting ratios as high as 100 to 1, which means that out of all that “fly on the wall” material that has been collected, only a small amount of footage is actually used. This means that the film editor has been highly selective in terms of what makes the final cut, and this selectivity almost invariably reflects a personal point of view. In contrast with Objectivist-influenced American direct cinema documentarians, outstanding European documentary filmmakers, such as Werner Herzog and Louis Malle, have been Interactionists. They recognize that every documentary film presentation necessarily involves interactions on the part of the filmmaker with his subject material, and they explicitly acknowledge that interaction by supplying their own personal commentary. Michael Moore belongs to the same camp and is an Interactionist, too, but he is operating in a popular society that clings stubbornly to the belief that Objectivism is the only option. So in SiCKO Moore gives the viewer his personal narrative describing his investigation into a sick social patient, which in this case is the whole of American society. You may well not agree with his point of view, but this is his journey and his telling. 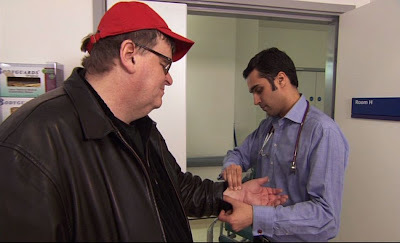 This makes his film not a scientific investigation (in fact there is not much material here about the US healthcare system that you don’t already know, anyway), but a personal story, and so it makes the film that much more compelling (and correspondingly infuriating to his opponents). The unwanted symptoms are first examined (Section 1). Next the recent history of how things got this way are covered (Section 2). Then successive examples of successful “treatments” given to other “patients” (countries) are presented (Sections 3-6). The final diagnosis is an exercise left for the viewer. But Moore reminds his audience at the end that America has always opportunistically borrowed good ideas from abroad and adopted them without prejudice. It is time, he says, for America to do that again. Supplementing the main sections are also some brief “entr'acte” pieces that are used for maintaining the mood and tempo of Moore’s presentation. Many people cannot obtain health insurance, even if they have the money to pay for it. The insurance companies reject applicants if they are too thin, too fat, or otherwise considered to be risky investments. Insurance companies deny claims and cancel policies if they can find some unreported pre-existing condition, even when it is as trivial as a past yeast infection. Insurance companies will not provide doctor-recommended and potentially life-saving treatment to a patient if it can be classified as “experimental” (and therefore not part of the standard practice). This section also documents doctors and case workers in the industry who are explicitly rewarded and paid bonuses for rejecting patient claims. The goal of the insurance companies, and their allies, the health maintenance organizations (HMOs), is to deny treatment as much as possible in order to maximize profits. Many of the cases presented portray people who died because they were denied treatment that could have saved their lives. This section has an emotive impact. 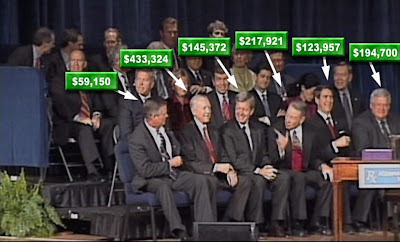 The viewer meets these people; they speak to the camera; and then many of them die. Although critics might complain that these selected cases are grossly unrepresentative of US healthcare, one has to ask how even one of these tragic cases has to come to pass. 2. Recent US Healthcare History (12 minutes). This historical background begins about forty years ago when archived US Presidential recordings reveal that Richard Nixon was attracted to supporting the idea of establishing HMOs, because these new organisations would try to reduce medical treatments as much as possible in order to secure higher profits. The commentary then recounts Hillary Clinton’s ill-fated efforts to reform the US healthcare back in the early 1990s. It is argued that the reasons behind Hillary’s speicific failure and always behind the political difficulties of American healthcare reform are the entrenched interests of the insurance companies, the HMOs, and the pharmaceutical corporations. All of these organisations are enormous economic enterprises that can use their economic clout to influence the government by effectively making campaign contributions (i.e. offering bribes) to government officials. 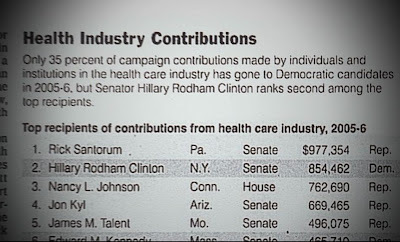 This has resulted in a convenient partnership – while each of the CEOs of the big healthcare organisations get salaries and payouts amounting to hundreds of millions of dollars per year, US senators are also all getting hundreds of thousand of dollars per year in campaign contributions. 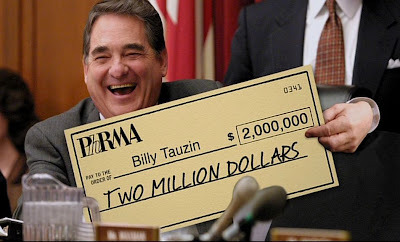 A particularly egregious example (presented with a photoshopped image to dramatize the point) is that of Billy Tauzin, a former US Congressman who left Congress and went on to become the CEO (with a $ 2 million salary) of the principal drug lobby, PhRMA. 3. Canada (10 minutes). The scene shifts to Canada, which does indeed supply universal healthcare to its citizens. Although US conservatives issue dire warnings about lengthy patient waiting lists in Canada that would presumably make their system undesirable, Moore suggests that there are some Americans who would definitely prefer the Canadian system over their own. He documents an American woman who tries circuitous schemes to get medical coverage in Canada that is not available to her in the USA. He also reports that even the Canadian Conservative Party is staunchly committed to the Canadian universal healthcare coverage. 4. England (19 minutes). England is another country offering universal healthcare coverage to its citizens. Moore shows that England even offers (or has up to now) free coverage to tourists who injure themselves while doing foolish things during their visits to the country. This section also includes enlighten ing remarks from venerable British politician Tony Benn about the England’s sixty-plus year experience of universal healthcare. To give up such a programme in England now, Benn says, would be as unthinkable as taking back the right of women to vote: universal healthcare is now an essential part of British civilization. Entr’acte. This interlude covers the sad tale of a female HMO worker whose young daughter dies during an emergency illness, because the HMO would not authorize life-saving treatment at the nearest hospital. 5. France (15 minutes). France, number one on the WHO tables, is of course the best when it comes to healthcare. More examples of the superior French system are provided, and this is further attested to by some American expatriates living in France who swear by the French approach. Entr’acte. Magnifying the contrast between the social inclusiveness of France and England and the divisive, profit-driven US system, this section shows how Los Angeles hospitals take indigent patients needing treatment and dump them off as if they were refuse at skid row shelters for the homeless. 6. Cuba, the Ultimate Irony (12 minutes). Taking note of the US Military’s claims that prisoners held in Guantanamo military facilities get comprehensive medical care, Moore decides to see if the US government is willing to offer the same kind of treatment to some real American heroes who ha ve been neglected. These are three volunteer 9/11 rescue workers who are still suffering from debilitating conditions incurred as a result of their efforts, but who cannot obtain medical coverage, because they were acting as volunteers and not employees. Why is it that so-called “terrorists” get better medical care from the government than volunteer patriots? This entire section, of course, is a stunt, but Moore sets it up to dramatize the inequities of the American system. His “boat people” voyage, with his ill passengers in tow, doesn’t make it onto the Guantanamo Bay military base, but the whole trip was basically a ruse for him to convey his patients not to the base, but to Cuba proper. That impoverished country, as we should know, just happens to have universal health care, and, as a consequence, a higher life-expectancy and lower infant mortality rate than the US. His patients all get the treatment in Cuba that is not affordable to them in the US. Moore’s thesis, of course, is not just that the US healthcare system is ill, but that entire US society is unwell. In France, England, Canada, and Cuba, they live in a world of “we”, not “me”. From a larger perspective this social/political problem is intimately associated with the rigidly Objectivist underpinnings of US popular culture that tries to comprehensively apply the idea that just about everything is property that can be rightfully exploited by its individual owner. A prime example of this reductionist mentality is the crippling insistence on the part of the US to impose worldwide “intellectual property” laws – the notion that an idea, an item of thought, can be a piece of property that is owned by an individual. In accordance with this line of thinking, US corporations have engaged in biopiracy by attempting to secure “intellectual property” ownership in foreign countries over essential food chains and traditional medicines, such as in India in connection with aubergines and basmati rice. I will cut short further discussion on the limitations of the notion of “intellectual property” here and simply refer the reader to the commentary in my review of Brett Gaylor’s RiP: A Remix Manifesto (2009). The main point to be drawn in this connection is that America's over-application of Objectivist-inspired “property thinking” has diminished its capacity to deliver healthcare properly. Pharmaceutical companies, HMOs, and health insurance companies are only interested in profitable returns on their investments, not on tending to the health needs of the citizenry. The real solu tion to this problem is to use an Interactionist-inspired approach, and that is just what Canada, England, France, and Cuba have done. Traditional conservative commentators, however, try to cast this healthcare debate into the old and simplistic notion of Capitalism versus Socialism, but this is not the signal dichotomy for the issue at hand and only confuses the debate. For one thing, two of the major communist countries, China and Viet Nam, do not now offer universal healthcare for their citizens. Their own ruthless adoption of Objectivist principles has led them to partially abandon the community-oriented welfare of their citizenry. In fact the places were universal healthcare is primarily offered today are in European countries that are primarily capitalist. And the capitalist-socialist divide is further muddied by the practices of some so-called bastions of capitalism. For example the WTO purports to champion capitalism, but engages in practices that actually restrict free trade by pressing for the propagation of “intellectual property”, laws. So, too, the “privatized” (but property-obsessed) HMOs largely restrict free trade and the freedom of consumer choice of their customer-members. In fact capitalism is not essentially Objectivist, and it can comfortably accommodate an inclusionist, Interactionist mode of operation, as is evidenced by France, England, and other European countries. (Note that Moore also had a considerable amount of film footage about Norway, but he didn't include it in the final edit, because it was redundant to his argument.) In those progressive European countries, there is a recognition that people are not pieces of property for which only a return on investment is expected. A point that Moore didn’t emphasize in SiCKO but that is germane to his thesis is that the reason why the Guantanamo Bay “detainees” were given proper medical care was that they were/are considered valuable pieces of “property”, not because they naturally deserve such treatment (as they should) by right of simply being human beings. The bottom line on SiCKO, then, is that Michael Moore has told his tale and made his case very effectively. With the evidence of this film, he now has to be recognized, if he hadn't been already, as a filmmaker of the top rank. Although his appearance and verbal style is folksy, it is clear that his film has been meticulously crafted. I understand that he had over five hundred hours of film to edit – a shooting ratio of more than 250 to 1, which would exceed that of most of the direct cinema productions. He and his staff have diligently mined archival footage to support his argument, and they must have put in an enormous amount of hours putting it all together so that the exposition is brisk, clear, and hard-hitting. Interestingly, Michael Moore’s work has been compared with that of direct cinema maestro documentarian Frederick Wiseman, because both have presented unflattering portraits of American institutions. But Wiseman is one of those sly selectors of recorded information who has managed to keep himself inconspicuous and still cunningly convey his own point of view. As much as I admire Wiseman’s work, I think Moore’s upfront approach is probably more straightforward (provided that accommodation is made for Moore’s heavy sense of irony). Finally, in view of the evident excellence of this work and its likely positive social impact, I guess I must at last forgive Michael Moore for his wreckless public support of Ralph Nader in the critical 2000 US Presidential election. We all make mistakes, and Moore has confessed that he made the wrong move, big time, on that occasion. 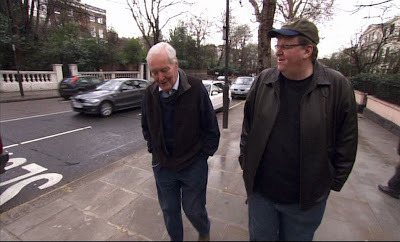 Since then, with Bowling for Columbine (2002), Fahrenheit 911 (2004), and SiCKO, Moore has emerged as an increasingly profound social commentator. In the end we could say that with Michael Moore's unshakable belief in, and prescriptions for, his unwell country's ability to make a recovery, he’s just what the doctor ordered.